A toilet that won’t flush is not serious as a plumbing emergency such as a flood. But it can create quite an unpleasant situation for the person who used the toilet not knowing that the water was cut off. But even if there is no water supply to your home, there are still ways of getting rid of the content in the toilet. Whether the water is turned off due to a plumbing repair or the municipality has cut off the water due to a bigger issue, there is a low-tech way out of this dilemma. Remember, the toilet tank usually fills up right after a flush and stays that way until it is used again which means the tank should be full even if the water supply is cut off. So you have one more flush left anyway. It is wise to use that flush during an emergency. But if someone accidentally used that flush, all isn’t over yet. How to Hack the Bathroom Toilet Plumbing In Your Home? 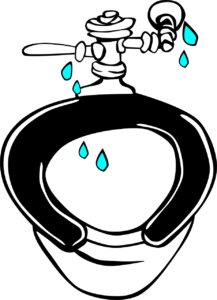 In fact, your bathroom plumbing system doesn’t require pressure or running water to function properly. You need access to water to fill the tank. But from this point, the process works entirely thanks to gravity. When the handle is pulled, the tank will empty its content into the bowl, pushing the content in the toilet down the drain. If you have no water going into the tank via the plumbing system, you are able to replicate its action is a very simple way. Simply manually dump a bucket of water into the bowl and you are ready with your flush. One advantage here is, it doesn’t matter what kind of water you use here. Since it is all going down the drain, you can use even dirty water for this purpose. If there is no water in your home, you can use a bucket of water from the nearby stream or rainwater for this purpose. In fact, it is a good thing to have a bucket or two of water filled in advance if you anticipate your water being cut off or having to turn the water off during the day. Plumbing contractors are willing to go through the hassle of undertaking even the dirtiest of jobs to ensure that you and your family have a functioning bathroom at all times. Whether you have a routine service call or an emergency, don’t hesitate to contact an experienced plumbing contractor in the area.